CR84FN #41 | Work in Progress. Aren't these colors STUNNING!!! I was so excited to tackle them! I decided to ink up a good ol' standby, my Turning a New Leaf stamps. I added a few blooms from the Flower Fusion series to bring in the colors. 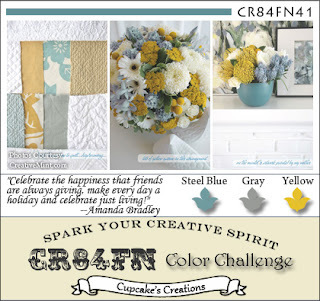 Posted in blue, CR84FN DT, flowers, grey, yellow . Bookmark the permalink. RSS feed for this post.